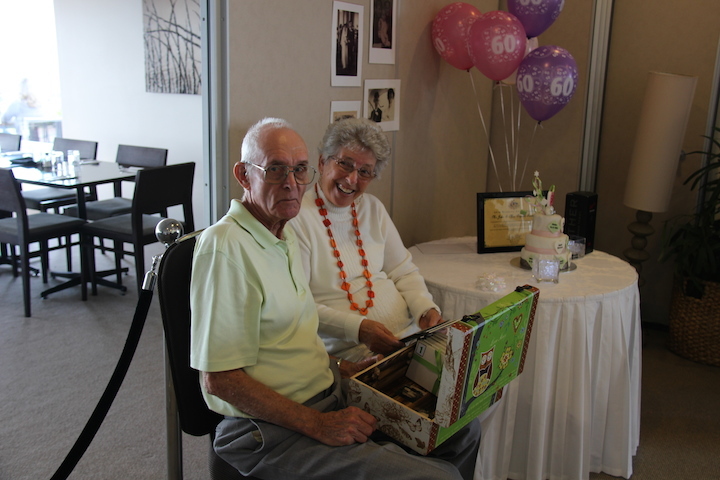 On the 5th June 2014 my parents celebrated their 60th wedding anniversary and I wanted to give them a gift that truly represented their 60 years of marriage. It was a marriage like any other, full of happiness and sadness, laughter and tears, joy and anger but always with love at the core of its existence. It was this love that surrounded me, my brother and sister as we grew up. 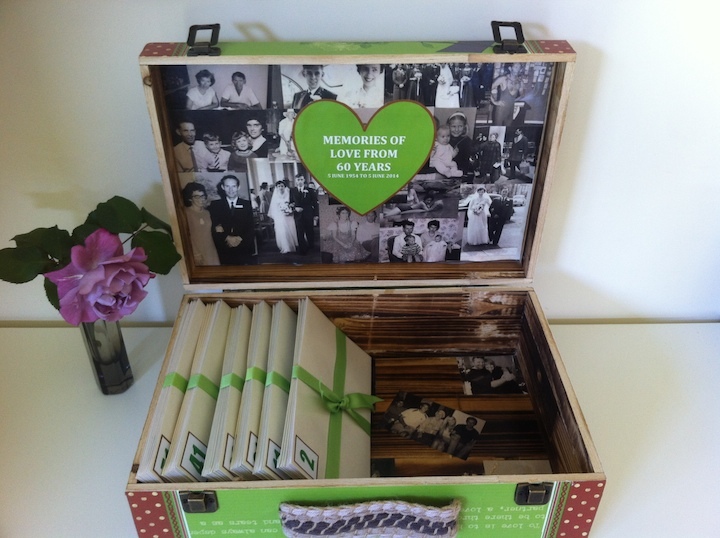 We had a wonderful childhood and what better way to express our gratitude for this than to give our parents the gift of 60 memories of love to celebrate their 60th wedding anniversary. The joy that it brought all three of us was amazing. The simple act of recording some of our childhood memories brought the three of us even closer together than what we had been. 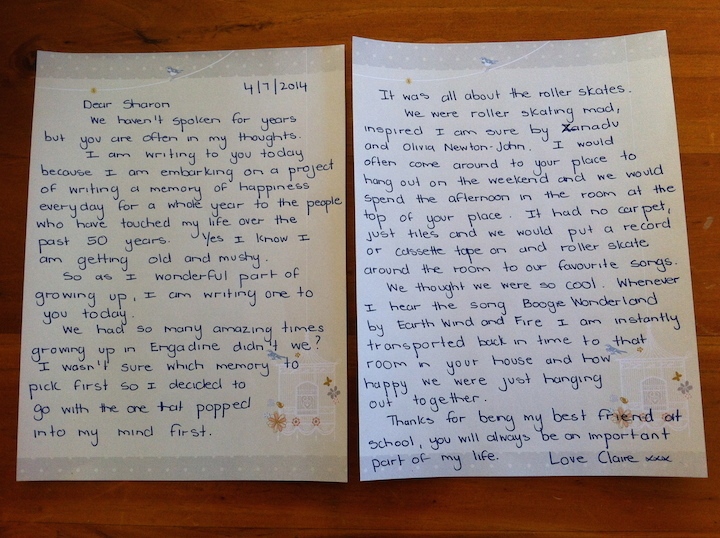 We knew that if we had received so much joy out of writing our memories that mum and dad would love it even more and that is exactly what happened. The beauty of a gift like this is that they got to experience it again for 60 more days. Each morning they opened up one envelope and read a memory of love from one of their children, it was such a wonderful way to start their day. There is something very special about opening up a hand written letter, about having the paper in your hand, about reading words that are not on a screen and about knowing that someone took the time to write that just for you. I received so much happiness from writing those letters that I decided to embark on this project. For one whole year I am writing and posting a letter of happiness, it may be a memory, it may be a thank you or it may be just a conversation. I am hoping that the person receiving it will experience as much joy from reading it as I did from remembering, writing and sending it. It is my way of sending a ripple of happiness out into the universe every day. 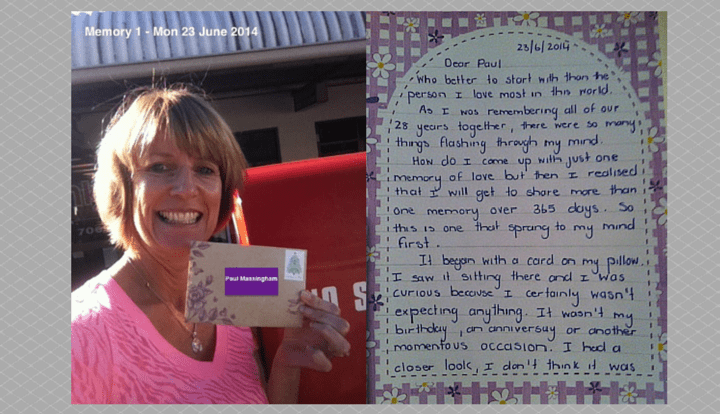 So on Monday 23 June 2014 I sent my first letter out into the universe. This is me at the post box, letter in hand ready to do it. 364 days later on Mon 22 June I sent my very last letter and completed a full year of letter writing. Honestly it was one of the most humbling and amazing things I have done. I learnt so much along the way and deposited heaps of happiness not only into my bank account but the happiness accounts of others. Click here to read my blog on the 7 Powerful lessons from 365 handwritten letters. Now that Project Happy Letter has officially finished I won’t stop writing letters. Instead of writing one a day I will write one a week as well as leaving some random acts of letter kindness where ever I go. It just takes one act of love to colour the world with happiness.